Three long barrows in this group have been radiocarbon-dated. An antler from the base of the ditch at Netheravon Bake has been dated to 3710–3350 cal BC (2σ; OxA-1407; Richards 1990, 259), Amesbury 42 has been dated to 3640–3370 cal BC (2σ; OxA-20594; Parker Pearson et al. 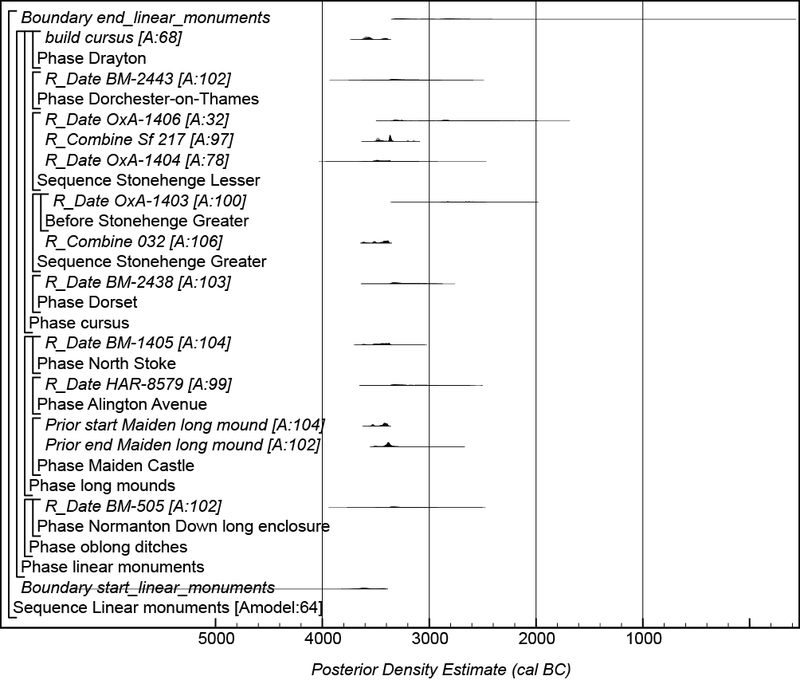 forthcoming, table 3.14) and a burial from beneath Winterbourne Stoke 1 to 3630–3360 cal BC (Parker Pearson et al. 2015, 1350). This suggests the long barrows belong to the mid-4th millennium cal BC, the earlier examples like Netheravon overlapping with the currency of the causewayed enclosures at Robin Hood's Ball and Larkhill in the second quarter of the millennium and the later ones like Amesbury 42 closer in date to the Stonehenge cursus, probably in the third quarter of the millennium. However, they are all earlier than the Normanton Down mortuary enclosure which is dated to 3340–3100 cal BC. By comparison, around Avebury, there is a greater range of dates for long barrows. West Kennet was built rather earlier than the dated Stonehenge long barrows (3640–3615 cal BC (83% probability; start_west_kennet_primary; Figure 18) or 3560–3540 cal BC (12% probability)) and Horslip may have been, though there are some doubts over the taphonomy of the sample from which its single date is derived. More similar to the Stonehenge examples, the earthen long barrows at Easton Down and South Street probably date to the third quarter of the 4th millennium, while that at Beckhampton Road and the chambered barrow at Millbarrow fall into a slightly later range, after 3330 and 3400 cal BC respectively. As alluded to previously, the definition of a long barrow is not unproblematic, and a wider discussion of their chronology in this region necessitates an exploration of the form of those beyond our study area. Long barrows are part of a broader group of linear monuments that do not all fall into clearly defined types, the elision of categories reflecting Neolithic practices of monument construction and reworking (Last 1999). Piggott (1966) noted that a basic distinction between 'unchambered' and 'chambered' long barrows was formulated by Thurnam in the 1860s (Thurnam 1869), though much argument had followed about whether the former were a distinct monument type or simply a translation of the megalithic tradition in areas where stone was not available. As Piggott noted, many excavations of earthen long barrows had revealed timber or turf mortuary structures, rendering their description as 'unchambered' questionable, though it was also clear that these structures, unlike many stone chambers, became inaccessible once the mound was constructed. And Piggott did not have access to information about those monuments excavated more recently, like Beckhampton Road and South Street, where no mortuary structures are evident. In the Stonehenge landscape we are concerned solely with non-megalithic earthen long barrows, which may be contrasted with chambered tombs in general; the suggestion that there was a destroyed barrow with a stone chamber at West Amesbury has never been confirmed. Chambered tombs can in turn be subdivided into long barrows (with earthen mounds) and stone cairns — though some, such as Ascott-under-Wychwood, have elements of both. There is also variability in the location of the chambers (lateral or terminal) and their layout (simple or transepted). Among non-megalithic long barrows size also matters, the shorter examples sometimes being called oval barrows. While others have suggested that these are a distinctive class of monument in terms of more than just their size (Darvill 2006, 84–85), the basis for such a distinction is not clearly defined. The oval barrows included in Appendix 5: Chronological Modelling, following Whittle et al. (2011, fig. 14.42), are those most distinct from the 'classic' long barrow form; at Stonehenge, only AM7, with small dimensions and a nearly continuous enclosure ditch, appears to be of this type, while the other possible oval barrows identified in the present study (AM140, WIL13 and WOO2) have more orthodox flanking ditches and are perhaps better seen as short long barrows. 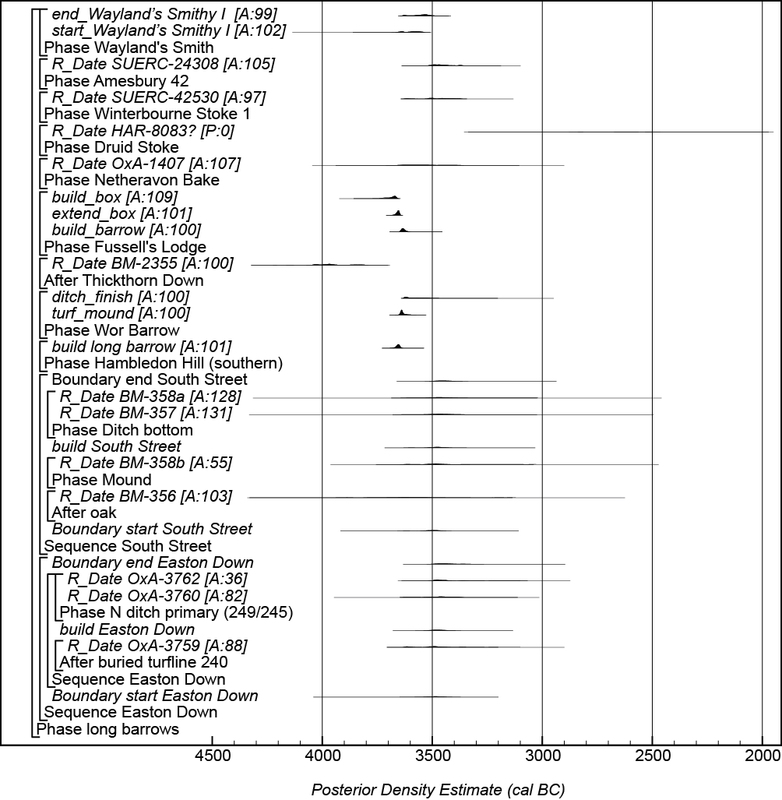 Figure 13: Schematic diagram showing the periods of use of dated monuments in south-central England of the 4th millennium cal BC. Given the difficulties in estimating when linear monuments went out of use an arrow has been used to denote when they would probably still have remained a visible feature in the landscape. Both long and oval barrows also overlap with a parallel tradition of non-mounded long (mortuary) enclosures, which includes the excavated example on Normanton Down (Vatcher 1961). Other related categories include cursus monuments and bank barrows, which could be seen as extremely extended long enclosures and long barrows respectively. 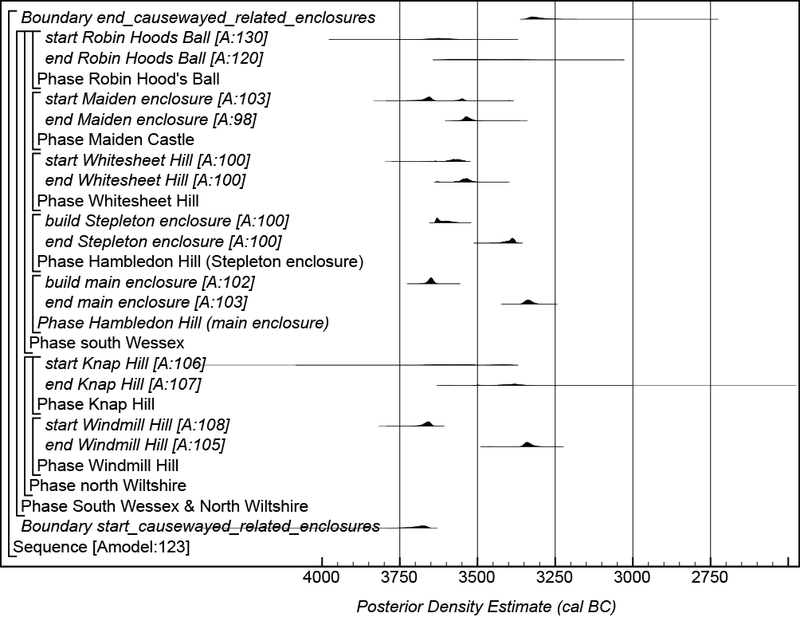 With all these ambiguities in mind, here we compare the period of use of non-megalithic earthen long barrows with chambered tombs, oval barrows and other forms of linear monument across central southern England, as well as with causewayed enclosures in a more local area of Wessex. 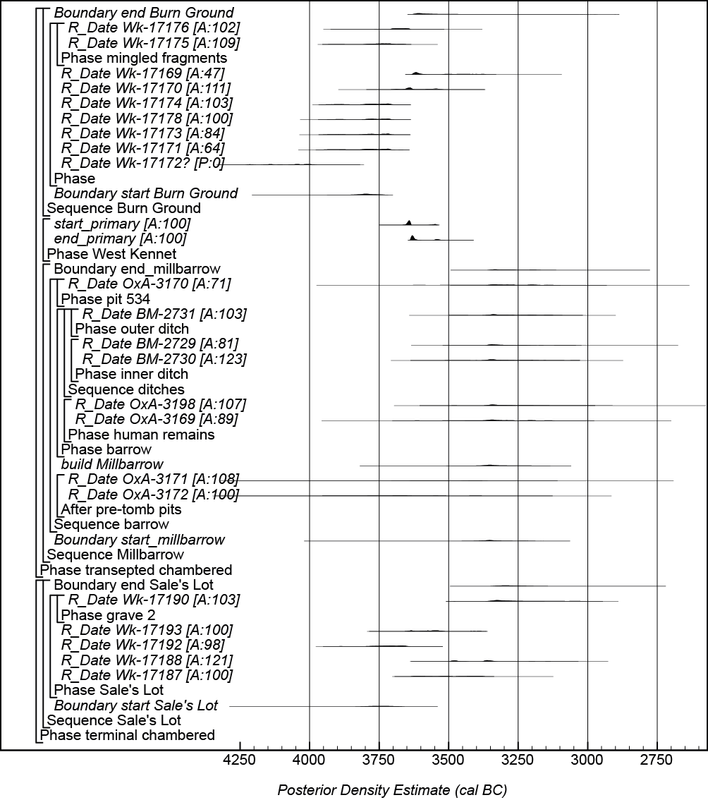 Figure 13 is a schematic diagram summarising the estimated dates when different types of monument were in use in 4th millennium south-central England. 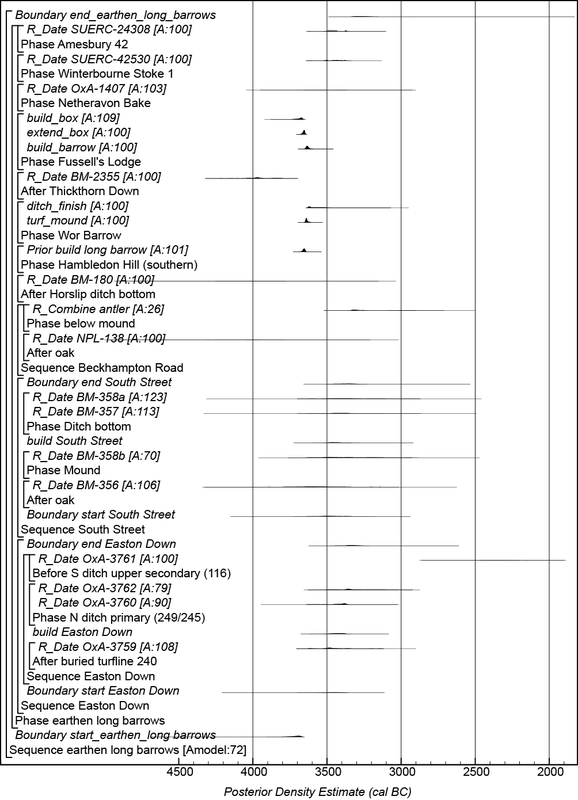 The horizontal bars represent the probability that a particular monument-type was in use in a particular 50-year period (light shading is less probable, darker shading more probable). Given the difficulties in estimating when linear monuments went out of use, an arrow has been used to denote when they would probably still have remained a visible feature in the landscape. 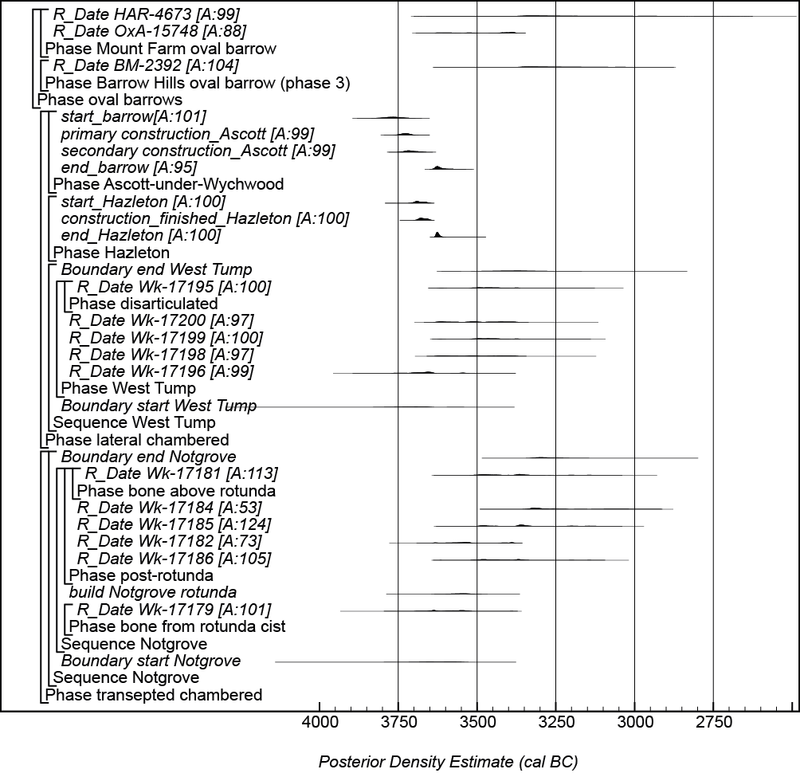 Distributions have been taken from models defined in Appendix 5; earthen long barrows (Figure 15), chambered long barrows, cairns and oval barrows (Figures 16, 17, 18, 19), linear monuments (Figure 20) and causewayed related enclosures (Figure 21). Chambered long cairns were the first monuments to be built in south-central England (86.4% probable; Table 2) from the late 39th/early 38th centuries cal BC. Chambered long barrows, causewayed related enclosures, and earthen long barrows were in use by the late 38th or early 37th centuries cal BC. Linear monuments were a later development than chambered long barrow, cairns, and causewayed related enclosures 65.6% probable; Table 2) first constructed in the 37th or 36th centuries cal BC. Oval barrows were probably the last of these monument types to appear (54.4% probable; Table 2) in the 36th or 35th centuries cal BC.